We are delighted to offer Intelligent Value Subscribers a one month FREE trial to our US Stocks Service. Please note that your credit card details will NOT be taken. The Hotline is delivered each morning (before the open) and provides market timing, sector rotation and stock ideas. Every trading day, we provide an update on the current status of the main US indices. One of the benefits of point & figure charts is that signals are clear cut: they are either bullish or bearish. We indicate current trends and identify areas of support and resistance i.e. where the current trend is likely to change. The NYSE Bullish Percentage was the first breadth indicator developed by Investors Intelligence in 1955 and since then we have added indicators for the Nasdaq and S&P indices. Breadth indicators were developed to determine the strength of a market trend by looking at the trends of its constituent stocks. They identify periods when the bulls are in the driving seat i.e. the best time to buy stocks, and have also proved to be a one of the best contrary indicators for calling intermediate market tops and bottoms. 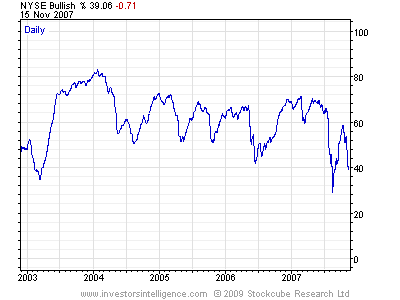 Check out the Bullish % Charts now by registering for your free one month trial to the II US Stocks Service. Just click here to sign up, free of charge! - Arm yourself with the most powerful tools used to find the relative strength, and internal activity of every major index and the 40 broad sectors. - Quickly identify the real direction and risk of the major market averages and the 40 broad sectors using Bullish Percent Indexes. Blue indicates Bull status, Red indicates Bear status. Groups marked with a + are in an up column. Click on a box to see the chart. Hover over a box for more details. - Maximize your profits and minimize your risk by uncovering the relative strength of sectors and stocks using our relative strength charts (line, candlestick, OHLC & Point & Figure). - Use our Sector screening tools. With a quick snap shot, you'll know which stocks are on buy signals, which are on sell signals, the date that the signal was given, and the strength of the stock. - Easily customize our interactive charts with your favorite charting indicators.